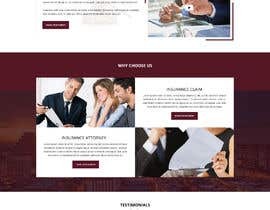 We need a new website for our law firm. We represent consumers who have disputes with insurance companies. We are trial lawyers and are looking for an image that promotes trust, but aggressiveness. This is a woman owned firm. We want to be taken seriously. We want to attract high end cases, so the image can not look cheap. We are fearless and looking to build a reputation as the best damn insurance attorneys in the state. We are focused on winning and getting the best results for our clients in the shortest amount of time. We operate from a team approach to ensure that our clients needs are met and they are always informed of where in the process their case lies. Our firm colors are maroon, white and gray. I have attached our old firm logo and would like to incorporate these same colors into the new website. The law firm name is The Insurance Claims Litigation Firm. The image will be mature, sophisticated, luxurious, and a middle ground between traditional and modern. We want the design built on the wordpress platform. We do not want old school stuff law firm look. The site should be modern, mature, sophisticated and luxurious. 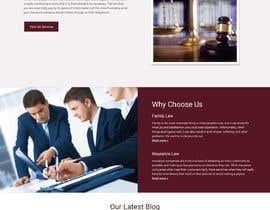 Our existing website is ejoneslaw.com. We want to use a similar color scheme. The website should have blog and video pages.